There is hidden, powerful wisdom in tattoos. Did you ever think of your tattoo as a charged body talisman or a portal into your spiritual self? Ancient cultures practicing shamanic tattooing laid the groundwork for our modern exploration of consciousness. Tattoos are both a revelation and a proclamation of your embodied archetypes, dreams, emotions, even a hint of past-life memories. 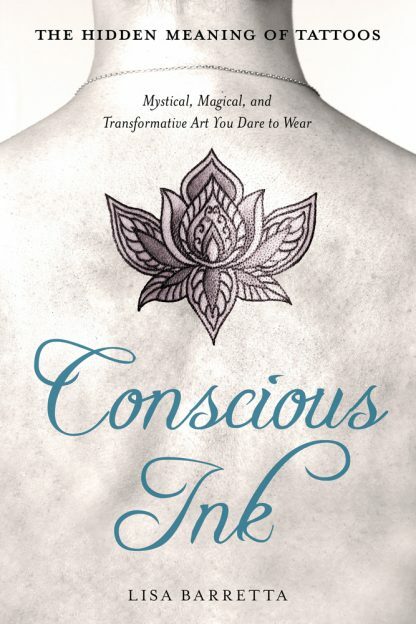 Conscious Ink shows how this edgy skin art interfaces with our body�s subtle energy field and reveals how tattoo imagery ties into the potent energy of inner alchemy that expands our self-awareness. Find out how/why intention is the moving force behind your tattoo�s vibration? Do you bring on good luck or bad juju? Understand why the piercing of your skin and drawing of blood forms a symbolic link into the energy field of your tattooist? Explore how tattoos reveal past-life/current-life emotional memory? Discover how tattoos can shift the emotional energy stored in certain body areas? Mindful inking can be an amazing modality that awakens your spiritual self. Looking at tattoos beyond the lens of body art, Conscious Ink gives you a new perspective on tattoos and their undeniable roots in pure, magic and mysticism. Lisa Barretta is a well-established intuitive counselor, Reiki practitioner, and astrologer. During the past 35 years, she has developed a client base that spans North America, the United Kingdom, and Europe. Lisa is an authority on consciousness, specializing in spiritual evolution and the paranormal. The executive producer of Surviving Death: A Paranormal Debate, she is also the author of The Book of Transformation and The Street Smart Psychic�s Guide to Getting a Good Reading.